Inspired by the magma, Amit Aggarwal played with colour, surface and form with an outburst of voluminous-shaped dresses and pants. He put to use methods such as quilting, pleating, and texture work to up the glam factor. Neon found its way back into the style radar with his signature gowns. 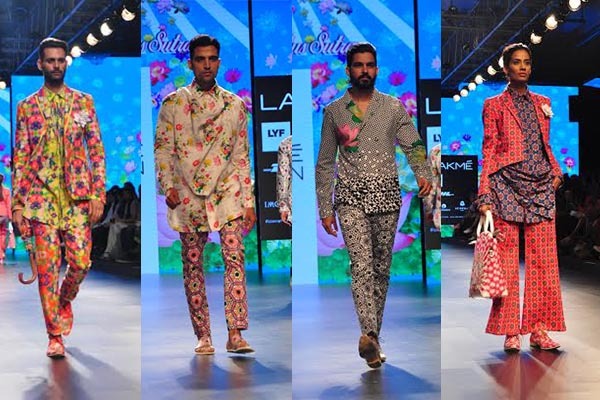 If you’re kicked about florals, then Payal Singhal’s latest collection is right up your alley. Floral lehengas, skirts paired with churidars, saris, anarkalis and metallic silver jumpsuits are all perfect for a wedding in the sweltering season. Soft mulmuls, clamp dyeing techniques and graphic block prints complement shibori patterns and linens at Urvashi Kaur’s showcase. Quickly becoming a staple, the grained khadi jumpsuit and other ensembles had frayed and raw edges, adding a touch of modern to ancient Indian crafts. Even though Karishma Shahani continued with her tie-and-dye technique on her usual cuts and silhouettes, this collection saw a huge focus on ombres. Ruffles, bows and patchwork jackets makes this collection a must have for the fearless bohemian. Don’t miss the gorgeous ombre eyeliner in smooth shades of blue and white. 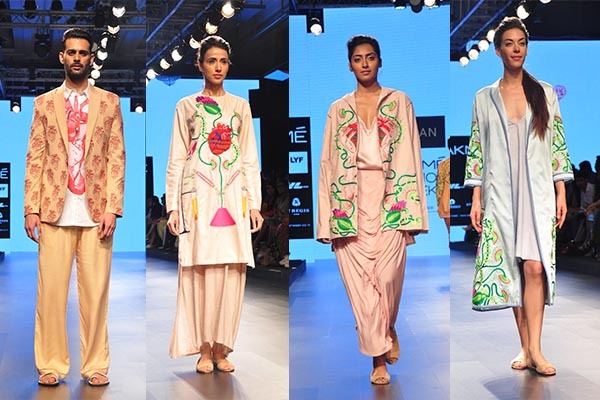 Fun florals were cleverly layered on maxis, bomber jackets and countryside dresses at Verandah by Anjali Patel Mehta. Titled ‘Interiors with eggplant’, the collection was pure avant garde with denim bralets, pleated fisherman pants and luxe pantsuits. Adding a fashionable twist to menswear, SOL showed a mix of jackets and oversized tie-and-dye shirts paired with bombers. The pastel suits and trousers were perfect for those trying to have a breezy day at the office. Debutante designer Jayanti Reddy showed a royal collection with vegetable dye prints and age old traditional concepts, merged with modern, contemporary cuts. We enjoyed this experiment in bridal wear. 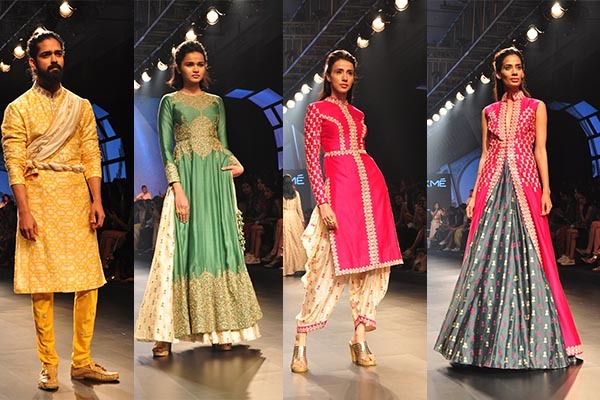 Vrisa’s spring summer collection titled ‘Ahir’ is a confluence of Bandhani and Kutch embroidery. Strong layering, cute as a button pompoms and very summer-ready separates in dusty turquoise made this a fun wardrobe. 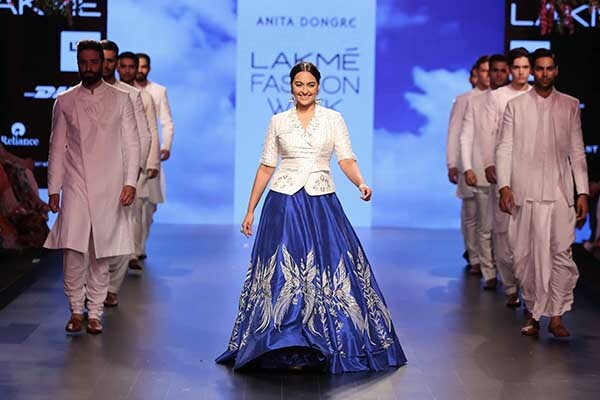 Inspired by the rich culture of Morocco and the famed Hasan II mosque in Casablanca, Sonam and Paras Modi of SVA Couture have created easy flowing lehengas, summery crop tops and layered jackets. Historic tiles and minarets translate into prints on a sunset and pink colour palette. 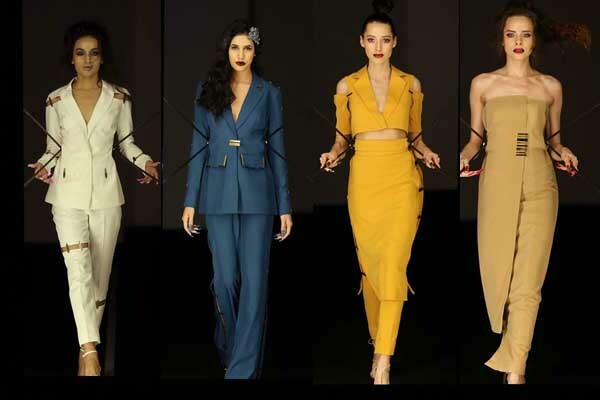 Ajay Kumar continues his print story from last season with ‘paradox of lotus sutra’. As the name suggests, the lotus pattern was the core motif. Don’t miss the totes and man purses that made regular appearances. Prints mixed with bright patterns, finely tailored blazers and well-structured silhouettes emphasised the coolness of this collection. 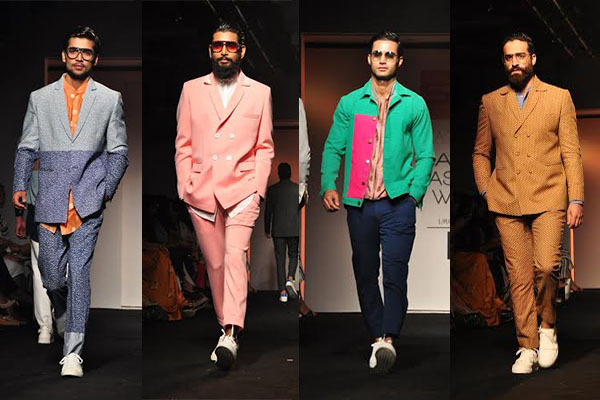 ‘Re-make’ by Aiman was a beautiful amalgamation of crisp structured shirts and blazers, and fluid skirts and trousers. We loved the heart embroidery and the intertwining Venus fly traps on white shirts that will hopefully bring some glamour to boring work-wear.